Randolph Scott played a key role in the emergence of the psychological western in the late 1950s in films such as Ride Lonesome and The Tall T where motives mattered more than action. This disjointed picture does manage to combine excitement and emotion, as Scott seeks to disprove a charge of cowardice by leading a cavalry detail to reclaim the dead after the Battle of the Little Bighorn. 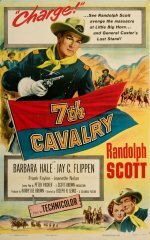 The skirmishes are solidly staged by B-movie specialist Joseph H Lewis, but the film's real interest lies in the way that Scott's character comes to believe that General Custer was a blundering incompetent rather than a glorious hero. "..finally I got a digital copy of this, after wasting my money on Amazon. Thank you for your excellent service. Ronald."